Upon their arrival in France 93rd Infantry Division colored troops were required to turn in all American equipment and arms and reequip with French issue. The only items that were exempt from the exchange were boots, breeches, shirts, overcoats, tunics and overseas cap, all of which remained US. Army issue. Most disagreeable of all was having to give up the most powerful and accurate weapon of its time the Springfield model 1903 rifle. The inferior French Lebel and Berthier rifles were issued in its place, both rifles used the inferior 8mm cartridge. Most of the men of the 93rd had become very efficient at firing the Springfield 03 rifle and were not pleased with the French rifles with their long bayonets and 3 round magazines. The men of the 93rd were also issued French 1903/14 leather belt, 1892 leather suspenders, 3 leather M1916 cartridge pouches, leather M1888/14 bayonet frog to secure the bayonet and a Épée-baïonette (Sword-bayonet) model 1886 with quillon or "catcher" and nickle-silver handle. Blade is 52 cm in length. The French Adrian helmet was also the replacement for the American M-1917 helmet. The mixture of equipment French and US Army would create serious problems for the 93rd Division. The first problem was the individual soldiers equipment carrying arrangement. The French Army issued a small backpack for extra boots, mess gear and tent items and a small haversack for rations. 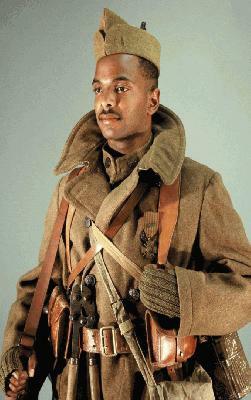 Each "Polilu" or French soldier was issued the 1914/15 French overcoat which had numerous large capacity pockets for carrying whatever other pieces of gear that might be needed. The US overcoat lacked the generous equipment carrying capacity that the French overcoat had. The result was that the French backpack combined with the US overcoat was a lack of carrying capacity and essential items for fighting and living in the field had to be discarded. The US Army supplied its troops with a large backpack that would hold almost everything that a soldier needed to live and fight in the field. Footwear for the men of the 93rd consisted of the 1917 canvas webbing leggings and M-1917 hobnail boots with hobnail soles. The canvas leggings proved to be inadequate for trench warfare and when they wore out were replaced with cloth wrapped puttees. The men of the 93rd would continue to receive US Army boots throughout the war. The US Army 1910 screw top canteen was clipped to the US Army 1910 belt was replaced by the French Army 2 liter 1877 canteen made of enamel and had a cork stopper which was outdated. An enamel cup was issued with the canteen and was tied to the canteen by the cork stopper string. The one item of equipment that that the men of the 93rd found to be a definite improvement over US Army issue was the gas mask. The issue gas mask of the US Army was of British design and required a clamp to be applied over the bridge of the nose to seal properly. Unfortunately the mask could not be made to seal tightly around the broad flat noses of many of the colored soldiers but the French ARS design nicknamed the "pig nose" didn't require a clamp and fit over all shapes of noses and faces. French rations proved to be a problem, French soldiers received a diet high in carbohydrates and American soldiers were accustomed to a diet high in protein. Soups and breads were the major component served in the French Army. American troops were accustomed to meat stews, steak, cornbread, cooked vegetables. Arrangements were made to provide additional supplies of more appropriate types of food from American commissaries. This worked as long as a regiment was in one place for an extended period of time but when the men were on the move the men had to make due for long periods on French rations which was insufficient in quaility and quantity and it seriously affected morale. The men of the 93rd Division were issued a liter of wine, usually claret, with each day's ration. The French soldier customarily drank a small portion of wine with each meal and before bed. The US troops not accustomed to being issued wine had not developed that habit, and many were inclined to consume the entire liter of wine at one sitting. This sometimes resulted in the appearance of German troops in trees and rooftops. The wine issue was discontinued and a sugar ration was substituted. We strive at all times to maintain the most historically accurate uniforms and equipment obtainable. We're committed at all times to accurately portray the role of a soldier in the United States Army in WWI attached to French combat units. WWI reenacting is a very expensive hobby involving the investment of hundreds to thousands of dollars. We don't expect a new recruit to come fully equipped if he's new to the hobby, however we do expect him to obtain the required equipment to portray the basic impression of an American Ebony Doughboy. Each new recruit will be assigned to a seasoned reenactor to help him obtain the proper uniforms and accouterments for a basic impression. We have a list of certain recommended reliable vendors that we feel offer the most accurate reproductions on the market.